OLD PARKED CARS. : Toyota Treasure Trove: 1967 Toyota Stout. 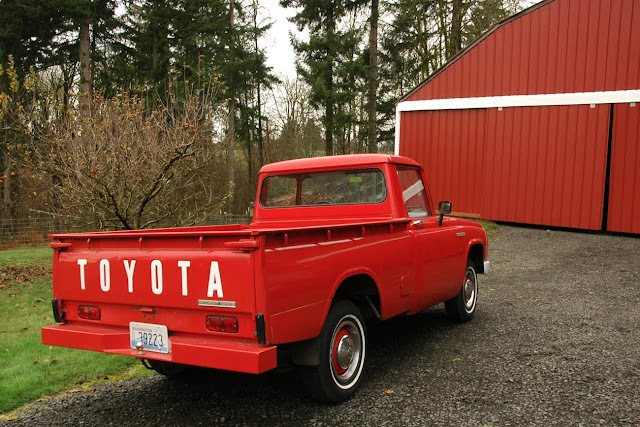 Toyota Treasure Trove: 1967 Toyota Stout. Stouts are so awesome. Beautiful condition; love the bright red. Cool interior, and those turn signals on the hood are just too cool. I've always thought these looked kinda American, especially from the front, like a late 50s/early 60s Chevy. just when I thought you guys were done with the Toyota goldmine you post another gem. what a specimen, she looks almost brand new. 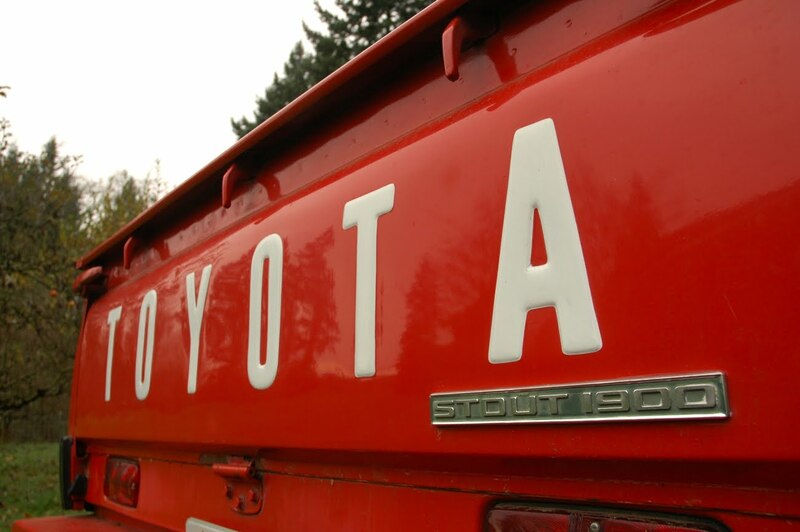 a great piece of Toyota history. I would not be surprised if the owner had a Toyopet crown too. These are like a 5/8 scale International pickup. Duh. Not a Chevy, an International! Good eye, Jim. I would rather have one really nice red and white FJ55 than these other Toyotas. This is my happy looking! Many nice car but this is most nicest you make the picuture. Well make, Tony Ben! Awesome! Guys anyone knows what those buttons are for? W P L.? Sorry if I'm a little green behind the ears. 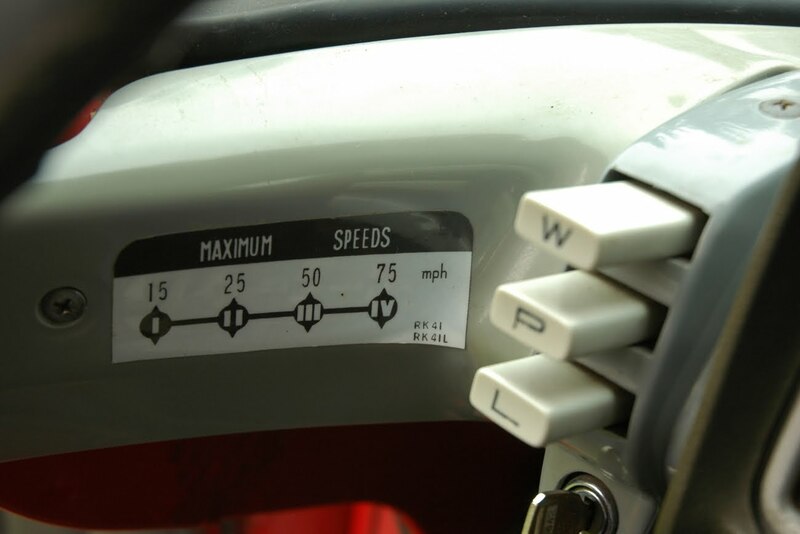 @ cesar, as far as I can tell, those buttons are w for wipers, p for parking brake or e brake and L for lights. that's my guess. 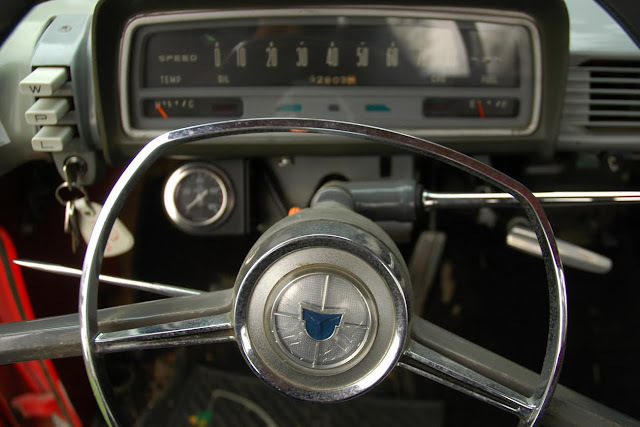 the buttons are often mistaken for a push button auto trans but this truck only came with a 4 speed manual column shift. so its not for the trans. GWT, I agree with your guess on the W and L buttons, but the P has me stumped. There's clearly a parking break handle to the right of the steering column under the dashboard, similar to later HiLux pickups. Maybe running (or parking) lights? I love these old Toyotas. Nice job! The P is for parking lights. I drive it work when it's dry out in the summer and we use it to haul hay for our llamas. Thanks Ben for posting the pictures. Love your site! @ GWT, Getafix and DaveH. Thanks guys, but P for parking lights? it would make since its right above the L button. Thank you for another excellent post. 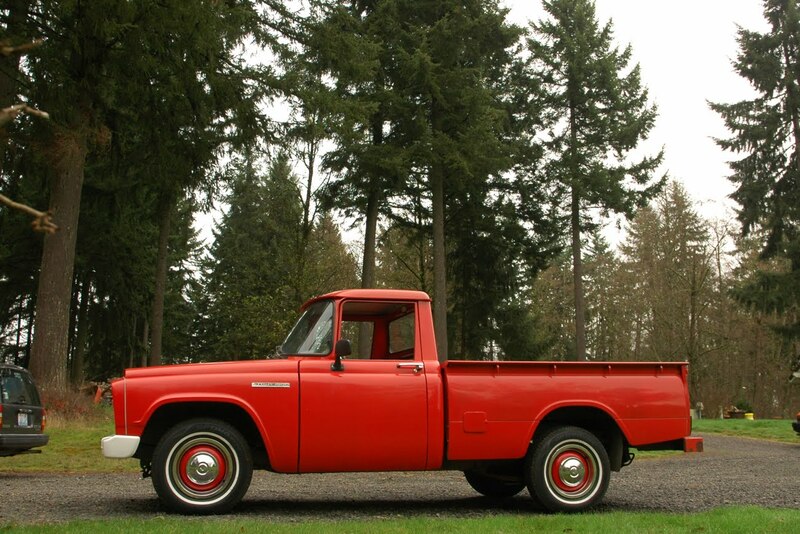 This is tied with the green Mazda rotary as the best truck I have seen so far on this site. Absolutely beautiful. Congrats Dave for it being in a remarkably stock condition. I am guessing it had a resto done? Would love to find one of these. 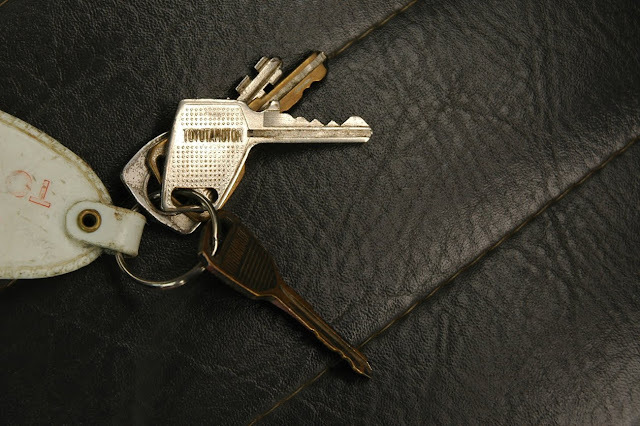 @ getafix yep, I saw the handle now. missed it before. I knew it was either parking brake or parking lights, but since I did not spy the handle before I thought maybe the parking lamps were in combo with the lights button and they decided to give it a weird push button e-brake which would be kinda cool. glad the buttons have been confirmed because at first it did confuse me until I thought about it. 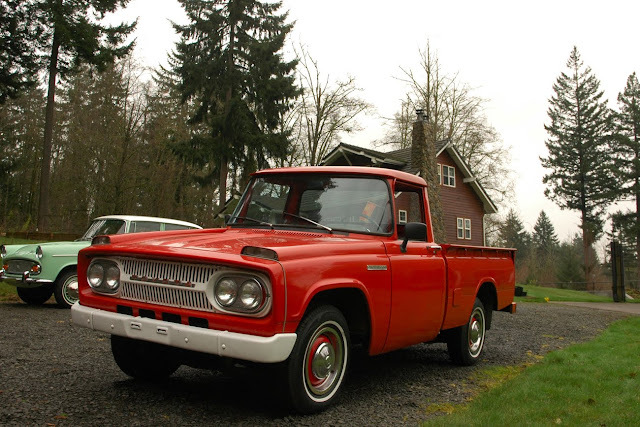 No, the truck is original, alas the wear on the paint on the inside of the door in the picture. If you look closely you can see some peeling paint and rust, particularly on the bumper. It lived in eastern Washington most of its life in a dry climate in a garage. A community college professor owned it for the majority of it's life and drove it to school in town occasionally. The 4 speed w/ granny low on the column is a trick to drive! If you can hit 60 on the freeway you're pushing it! 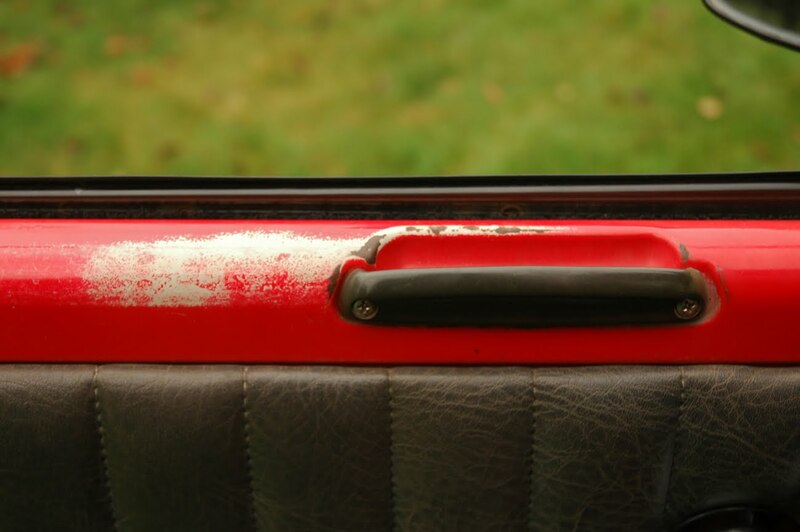 Are those inside handles supposed to be black? They are chrome in the stouts I have looked at. "sell my junk car" is a spammer. Beautiful Stout, absolutely love them. They're like Japanese American pickups. At first I thought this collection might be a part of Eddie's (OldSeriesGarage). Dave, please be careful with storage! A treefall took out a few of his cars a while back, and the wooden bastards appear to be conspiring to do the same to yours. Sarah, Send me a pic of your stout you're trying to sell to purplefalcon77@yahoo.com My red one doesn't need much done anymore and I could use another project!